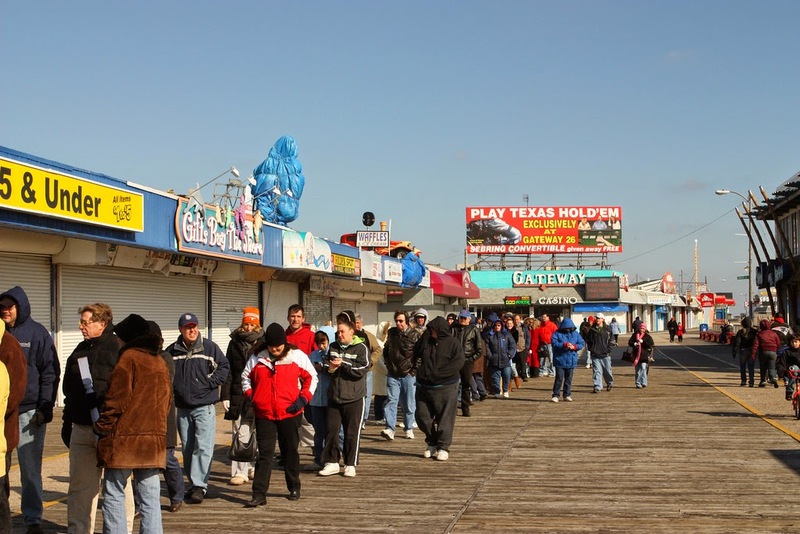 On this day, 10 years ago, an estimated 2,000 people lined the Boardwalk to pay homage to one of the most unique attractions in Wildwood history. ... Amid brutally frigid conditions, as no one who attended will ever forget! The proclamation from the City of Wildwood that officially declared January 30th "Golden Nugget Day" cited the estimated 1.7 million adventure-seekers who enjoyed the landmark over its nearly four decades of operation. The iconic centerpiece of Hunt's Pier, the Golden Nugget Mine Ride was a hybrid darkride/steel roller coaster attraction that changed the landscape of the Jersey Shore's amusement scene when it debuted in the Spring of 1960. 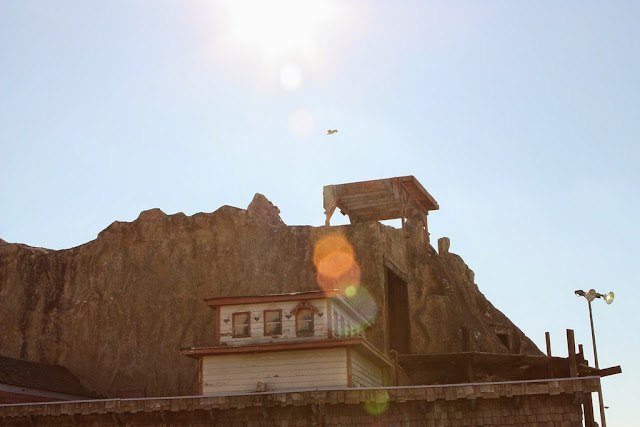 Designed by John C. Allen of the Philadelphia Toboggan Company and produced in conjunction with the renowned outfit and the skilled Hunt's staff (led by general manager Vince Kostek), the Nugget evolved into a bona fide landmark over time. 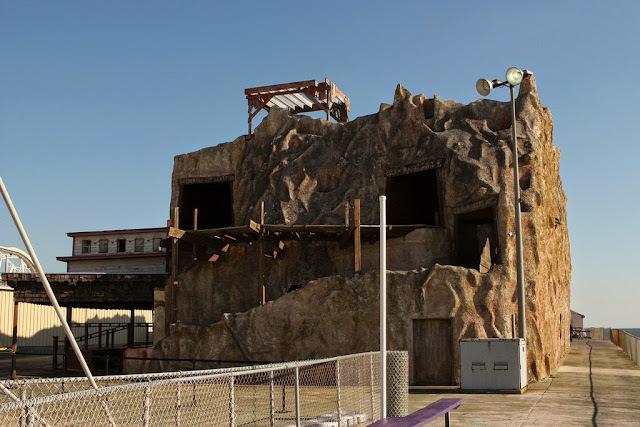 It would thrive during the "Oceanic Wonderland" and Wildwood's glory years of the 60s and 70s, then survive through several post-Hunt's incarnations and a dinosaur-theme adoption, running for the final time in 1999. 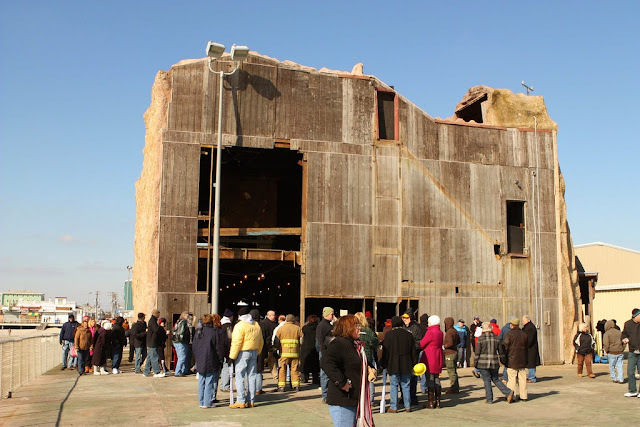 Its impressive frame, built to resemble a western mountain with a mining outpost and shafts built in, was hollowed out to accommodate a farewell ceremony hosted by the Morey Organization on Saturday, January 31, 2009. The weathered structure was demolished shortly after. 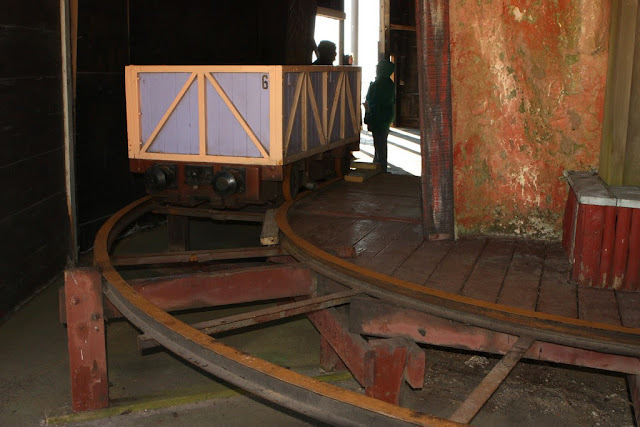 Its track system and trains were acquired by Knoebels Amusement Resort in Elysburg, PA, where its legacy lives on in the form of the Black Diamond. 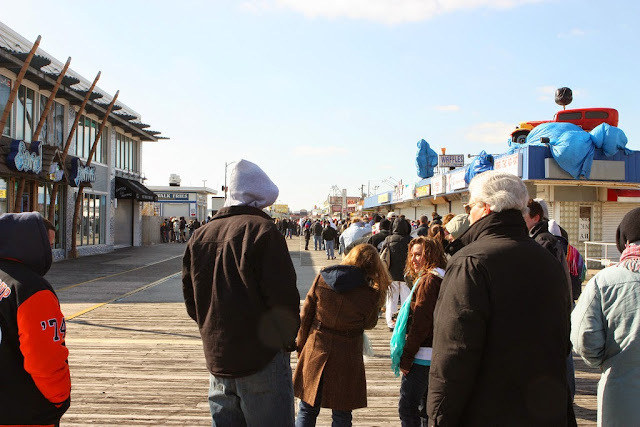 The Nugget boasted long lines during Hunt's Pier's prime years, but nobody expected this! The faithful crowd formed early, and at one point stretched all the way down to Gateway 26 (notice the old facade, signage and billboard) at 26th Avenue, two blocks north. 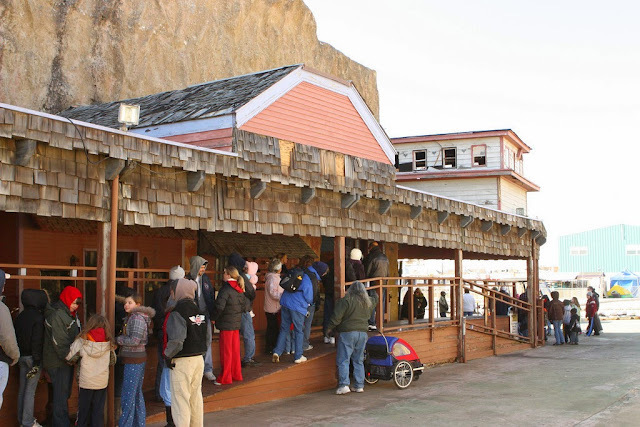 The former train platform had one last hurrah as a gathering place for the excitement. Many in attendance were too young to have actually experienced the ride when it was in operation. 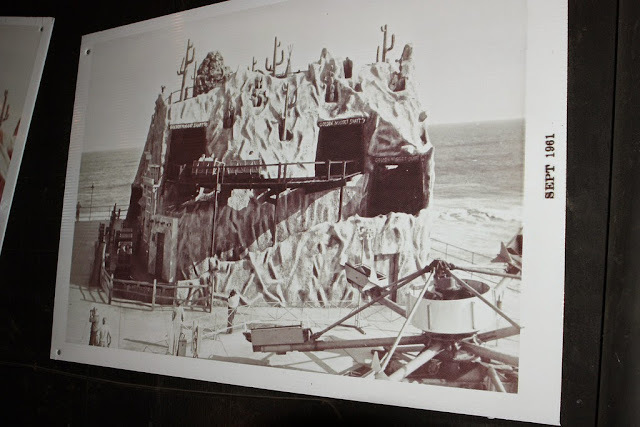 View of the back (eastern, ocean-facing) east side of the structure, which took the brunt of the ocean winds on that day, as it had for nearly a half-century. Various props from the ride's history, including this giant spider designed by the legendary Bill Tracy, were on display. 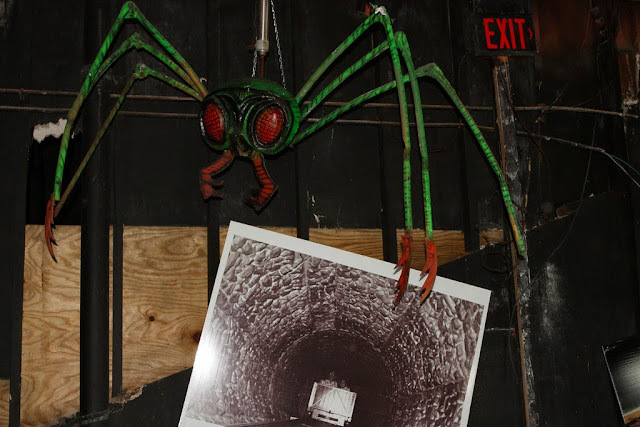 The spider, along with the charging wolf and spinning barrel tunnel stunts have been restored and presently reside inside operating Morey's Piers dark rides. Have you encountered them?